Charles Kurzman, “The Man Who Broke the World,” June 29, 2018. Bashar al-Asad was training in London to be an eye doctor when his father ordered him into the family business: ruling Syria. Asad’s disastrous performance in this role has triggered a cascade of catastrophes that now threatens to undermine the international institutions that have suppressed global conflict for decades — arms control treaties, development aid, intergovernmental organizations — and the sense of shared purpose that motivated them. It may be unfair to blame this disaster on one individual, and Asad has had lots of help, but nobody has done more than him to undermine global cooperation. The descent began on March 18, 2011, when the Arab Spring arrived in Syria. Protesters demonstrated peacefully in Daraa, a border town in the south of Syria, chanting, “God, Syria, Freedom, and nothing more!” Security forces opened fire, and protests spread across the country. 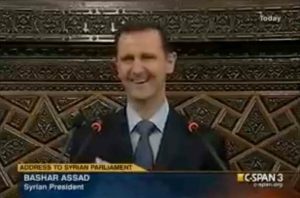 On March 30, 2011, Asad addressed his people in televised speech to Syria’s parliament (see video and transcript). He could have resigned in the face of popular disgust at his family’s brutal rule. He could have allowed free elections. He could have offered amnesty to the protestors who had been detained and tortured. In the beginning they started with incitement, many weeks before trouble started in Syria. They used the satellite T.V. stations and the internet but did not achieve anything. And then, using sedition, started to produce fake information, voices, images, etc. they forged everything. … Then they used weapons. They started killing people at random; because they knew when there is blood it becomes more difficult to solve the problem. We have not yet discovered the whole structure of this conspiracy. We have discovered part of it but it is highly organized. Civil war ensued. Within three years, al-Qa’ida’s newly formed Syria affiliate controlled much of northern Syria. Al-Qa’ida’s Iraq affiliate controlled much of eastern Syria, then conquered northwest Iraq and proclaimed itself the “Islamic State.” Asad’s government bombed and besieged his own population. Brutality on all sides displaced half of the country’s population; a quarter of the population fled to neighboring Jordan, Lebanon, and Turkey. In 2015, a million Syrian refugees trekked to Europe, by foot and by boat, seeking asylum. Right-wingers in Europe claimed that the refugees constituted a Reconquista in reverse, threatening Europe with Islamist ideologies, terrorism, and other violent crime. These threats did not materialize on a large scale, but a handful of high-profile incidents raised anxieties, and right-wingers in country after country made political gains, translating their exaggerated fear of foreigners into assaults on all forms of international cooperation, including the institutions of the European Union. The EU was already under strain from debates over loan defaults and austerity policies, and it struggled to accommodate Asad’s refugees. The Brexit movement used images of refugees and demanded that the United Kingdom “break free of the EU and take back control of our borders.” Anti-EU politicians gained power with campaigns against refugees in Hungary and Poland (which actually took in very few refugees) and Italy (which took in quite a few refugees). At the same time, another byproduct of Asad’s intransigence, the self-proclaimed Islamic State, managed to recruit or inspire several hundred Europeans and North Americans to engage in revolutionary violence. Few of these plots were sophisticated, but deadly attacks such as the shootings in San Bernardino and Orlando played into nativist paranoia. Donald Trump fanned these fears at every campaign appearance. Bashar al-Asad was hardly the only reason that Trump was elected, but he helped. In his first year and a half in office, Trump has rejected multilateral agreements on climate change, trade, and nuclear proliferation. He has threatened nuclear war with America’s enemies, tariff war with America’s trade partners, and Twitter wars with everyone. Trump’s brinksmanship, his contemptuous statements, and his zero-sum approach to foreign policy now threaten the international order that the United States itself constructed after winning World War II. Asad must feel gratified. Despite his incompetence, his regime has survived, with the assistance of Russian air power and Iranian ground forces, and has reconquered much of the territory that it had lost to Syria’s <a href=”http://kurzman.unc.edu/syrias-four-revolutions/”>multiple uprisings</a>. Nationalists in the West share Asad’s sense of grievance: in their view, the international order was a bum deal for their countries, too, even for the United States. They used Asad and his failures as excuses to challenge the institutions that Asad himself detested. This is Asad’s global legacy: a broken world of warring nationalisms, unrestrained by international institutions.